Sharmila Mukerjee is the founder and artistic director of Sanjali Centre for Odissi Dance in Bangalore which was established in 2004. After completing her schooling in Loreto House, and graduating from Presidency College, Kolkata, Sharmila followed her one and only passion- dance. Initiated into the Uday Shankar style of dance,Sharmila, at the young age of sixteen played the main role of Chandalika in Tagore's dance drama "Chandalika" during the poet's birth anniversary celebrations in Calcutta, and caught the attention of the critics who wrote about her inborn grace and amazing stage presence. 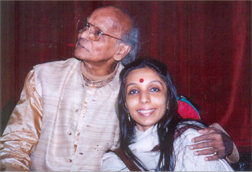 Thereafter, Sharmila started learning Odissi under the tutelage of Guru Kelucharan Mohapatra from 1984 in Kolkata. Rigorous , intensive training in Odissi continued at her Guru's residence in Cuttack and Bhubaneswar. Guru Kelucharan Mohapatra himself accompanied Sharmila on the mardala for her Rangapravesh in 1988, and thereafter, Sharmila started performing Odissi as a solo artist and in some productions directed by Guruji.She also took lessons in Abhinay from Smt.Kalanidhi Narayan and attended workshops conducted by late Smt.Sanjukta Panigrahi. Sharmila initially taught Odissi at Calcutta School of Music and also looked after the administration of that institute for a year, as Secretary of Indian Music Section.She has worked very closely with hearing impaired children as she taught dance and movement therapy at The Oral School for Deaf Children, Kolkata and choreographed and directed many productions with these children, the most notable among them , being "Ramayan" a full length dance drama in which more than 50 hearing impaired children participated.After moving to Bangalore, she also taught dance at the Sheila Kothwala Institute for the Deaf and for a few years .In the year 2000, she won a scholarship to the University of Michigan( Ann Arbor) for a period of 3 months where she trained in dance movement and composition.She also did intensive workshops learning dance movement and how to work with hearing impaired children, at the British Council Calcutta, under the guidance of visiting faculty members form Laban Centre, U.K.
A Grade A artist of Doordarshan and an Established artist of the Indian Council for Cultural Relations, Sharmila has performed at various prestigious festivals and conferences in India and abroad in countries like Fiji, Malaysia, Australia , New Zealand, Italy, U.S.A, Indonesia and U.A.E . Sharmila has won various awards like the Singar Mani from the Sur Singar Samsad ( Mumbai), the Kala Gaurav from Karnataka, and the Sironama from Kolkata .Sharmila was recently conferred with the prestigious Mahari 2016 Award from the Guru Pankaj Charan Das Foundation ( Orissa) for her contribution to Odissi dance. Sharmila is also a choreographer and has created many dance pieces and directed a number of productions in Odissi.She is the Artistic Director of the Sanjali Ensemble which is committed to promote Odissi throughout the world by presenting traditional and innovative choreographies.The Sanjali Ensemble has been empanelled by the Ministry of Culture ( Govt.of India) in the "outstanding" category to participate in festivals of India abroad. Having made Bangalore home now, Sharmila continues to spread this dance form through her teaching and performances, to many students in and outside the city , and also to foreign students who come for training at Sanjali , Bangalore. Many students have done their rangapravesh under the guidance of Sharmila who has made a name for herself as one of the pioneers of Odissi in South India. Sanjali has opened various branches all over Bangalore , and many of Sharmila's senior students are solo performers and help her to run her classes and teach independently themselves.